I used to teach students of class 5 to class 8 initially. I can deliver my knowledge to enrich my students and I take the full responsibility that they score higher. Regular tests and personal attention to every individual will definitely make them score well. My hardwork and dedication is always there for my students. "Purbayan Sir is very considerate, nice and easily approachable. His doubt clearing capabilities are really awesome and the parents can be well assured their words are placed in good and responsible hands. " 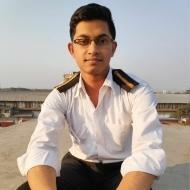 "Purbayan sir has got really good and modern teaching techniques and is very good in communicating with his student's level of understanding. I was quite benefitted with his assistance. I'd recommend him. " Purbayan Dhar conducts classes in Class 10 Tuition and Class 8 Tuition. Purbayan is located in Taratala Road, Kolkata. Purbayan takes at students Home and Regular Classes- at his Home. He has 2 years of teaching experience . Purbayan is pursuing Bachelor of Technology (B.Tech.) from Indian Maritime University, kolkata. He is well versed in Hindi, Bengali and English. Purbayan has got 2 reviews till now with 100% positive feedback.